46076 CAPE CLEARE No recent reports. 46061 Seal Rocks No recent reports. 46060 West Orca Bay No recent reports. BLIA2 Bligh Reef Light, AK No recent reports. 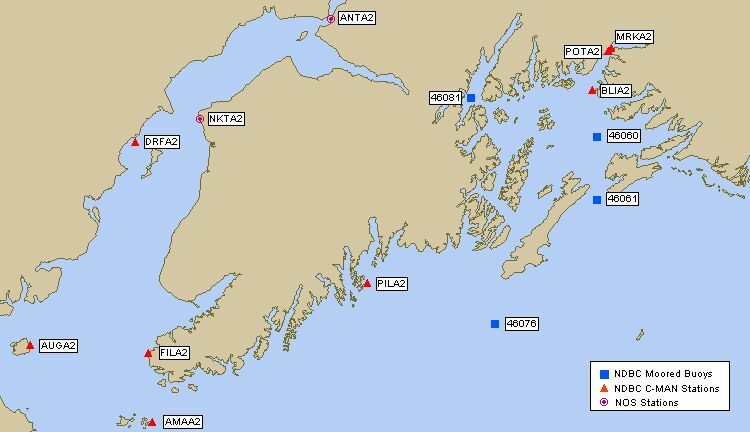 POTA2 Potato Point, AK No recent reports. MRKA2 Middle Rock Light, AK No recent reports. AMAA2 East Amatuli Stn Light, AK No recent reports. PILA2 Pilot Rock, AK No recent reports. 46081 WESTERN PRINCE No recent reports. DRFA2 Drift River Terminal, AK No recent reports.